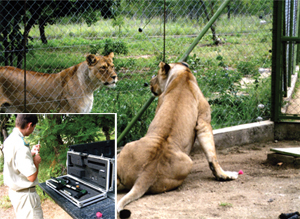 One routine visit to the lions revealed that Caesar had an injury just behind his left shoulder – most likely caused by his playful companion Sarah. Although he did not appear distressed, it was decided to take no chances and to anaesthetise the huge lion and treat the wound. 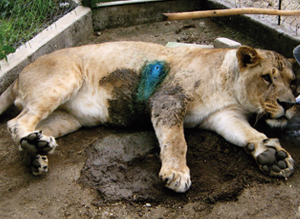 Caesar and Sarah were separated, and with the first shot, the vet darted Caesar in the thigh. As he succumbed to the tranquilliser, Sarah came to the fence to be with him – the pair have had a special bond since we rescued them together from a circus in Portugal. The wound was infected, but was quickly cleaned and treated. In no time after the anaesthetic antidote, Caesar was back on his feet, with the only sign that anything had happened being the blue anti fly cream on his coat. He was soon back at play with Sarah.